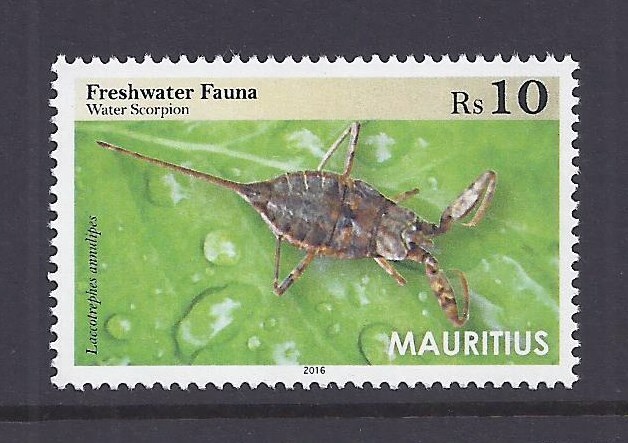 After a set of fours stamps on the theme 'Freshwater Fauna', released on 6 June 2016, the Mauritius Post released on 18 October 2016 a set of four stamps on the theme 'Freshwater Flora'. B. monnieri, commonly referred to as the water hyssop, is a perennial (lives for more than two years), creeping herb native to the wetlands of southern and Eastern India, the Mascarenes, Australia, Europe, Africa, Asia, and North and South America. Usually found on marshes of brackish water around coastal areas, B. monnieri is fairly ramified, with roots appearing on the nodes of the branches. The leaves are relatively fleshy, and the solitary flowers are white despite tinges of purple having been observed occasionally. The water hyssop is a medicinal herb used in Ayurveda, where it is also known as "Brahmi", after Brahmā, the creator God of the Hindu pantheon. It is thought to cure epilepsy, asthma, ulcers, tumors, ascites, enlarged spleen, inflammations, leprosy, anaemia, and gastroenteritis. 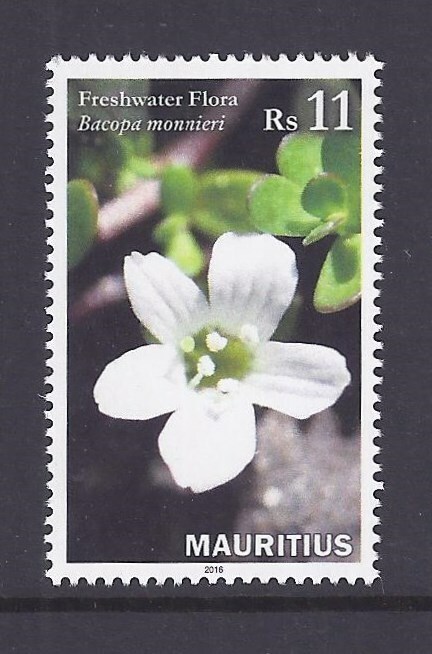 B. monnieri is listed as 'least concern' by the International Union for the Conservation of Nature (IUCN) as it is widespread with stable populations and does not face any major threats. L. octovalvis can be found in Central America, the Mascarenes, Australia, South-East Asia, the Middle East, and the Central–West African regions. The Mexican primrose willow is found on wet areas, marshes and along rivers or paths. It grows to one meter tall on average, though old specimens can exceptionally reach up to four metres in height. Its leaves are covered in small hairs and its flowers are yellow in appearance. 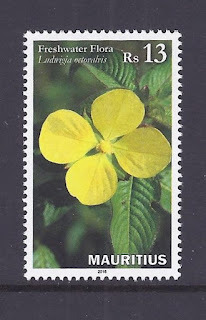 In Mauritius, this species is commonly referred to as "herbe les mares", "herbe gandia" or "herbe Joséphine". Used in herbal medicine, L. octovalvis is known for its anti–ageing properties. L. octovalvis is usually considered as an invasive species and is also listed as 'least concern' by the IUCN. N. nucifera, commonly known as the lotus or the sacred lotus, is an aquatic perennial native to tropical Asia, and Queensland, Australia. 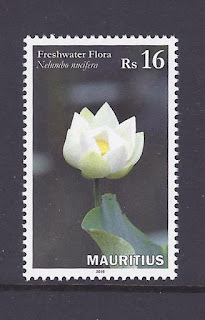 It is the national flower of India and Vietnam. N. nucifera is considered as sacred by Hindus and Buddhists. It is associated to many Asian divinities who are often represented with the flower or the plant itself. Besides, the lotus is also edible; its stems, leaves and seeds can be consumed raw, cooked or ground into flour. N. nucifera also has proven anti–eutrophication properties. Its large leaves reduce sunlight reaching the lower part of the water. Algae growth is subsequently reduced and oxygen content has been observed to be 20 percent higher. 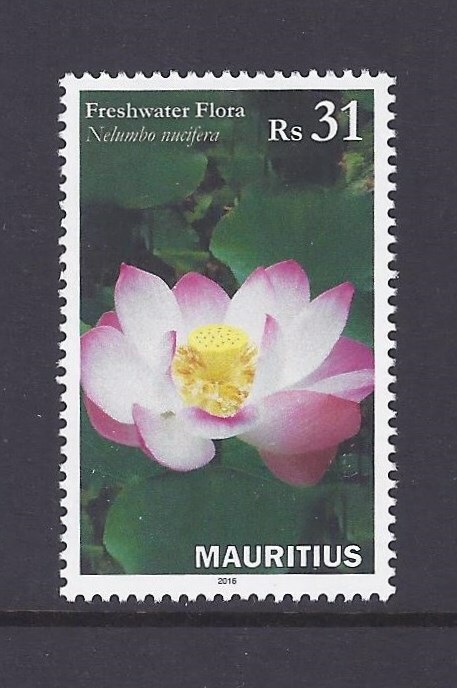 The first specimens of the sacred lotus were introduced to Mauritius in the 18th century under French rule. Local specimens can be found at the Pamplemousses botanic garden, and occasionally in private gardens. 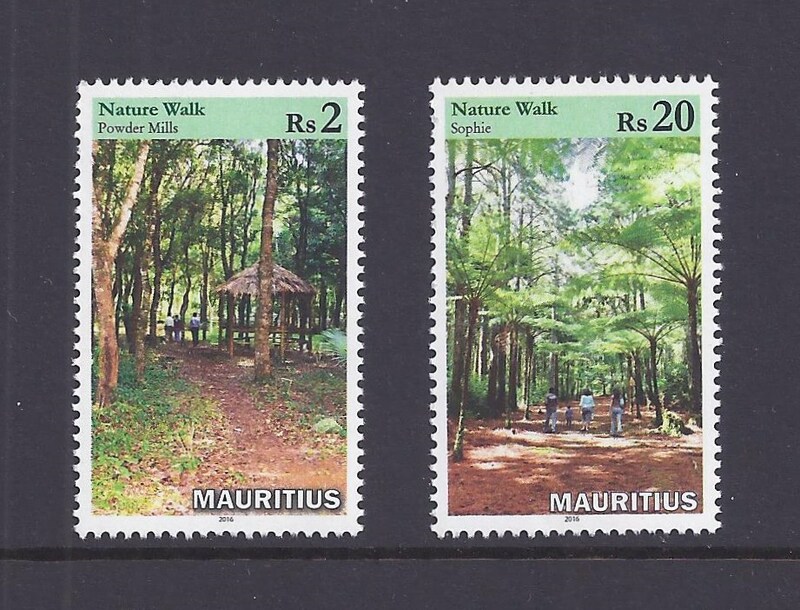 On September 15, 2016, the Mauritius Post in collaboration with the Forestry Service released two "Nature Walk" stamps, depicting Powder Mills Nature Walk (Rs2) in Pamplemousses and Sophie Nature Walk (Rs20) in Plaine Sophie. The Forestry Service under the aegis of the Ministry of Agro Industry & Food Security has created three nature walks, namely: Powder Mills Nature Walk, Pamplemousse; Mon Vert Nature Walk, Forest Side; and Sophie Nature Walk, Plaine Sophie. The nature walks were created with a view to providing forest leisure and recreational facilities to local and tourists. 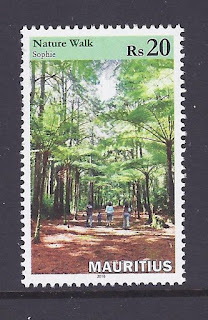 The nature walks also provide a great opportunity to learn and appreciate the rich and native biodiversity of Mauritius, their value to society and the need for conservation and protection of fragile ecosystems. The nature walks are managed by the Forestry Service and are open to locals and tourists alike free of charge. The trails are open between 8 a.m. and 3 p.m. on weekdays and 8 a.m. and 4 p.m. during weekends and on public holidays. 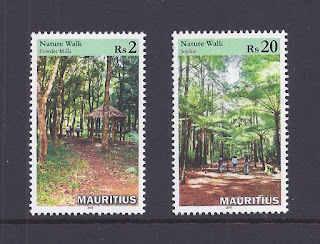 Powder Mills Nature Walk is located in Pamplemousses near Sir Seewoosagur Ramgoolam National Hospital. 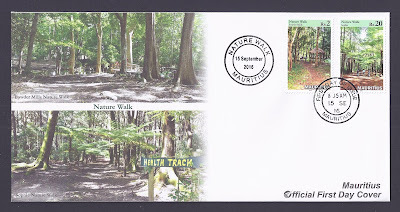 Inaugurated on May 17, 2007, the nature walk covers an extent of 60 hectares of State forest land and includes a Visitor's Interpretation Centre, a native plant garden and a medicinal plant garden. A network of 3 km trails with pathways, kiosks, picnic areas has been created for the public to enjoy the natural environment and rare endemic plants. The site is also crossed by a river; it also includes a forest nursery where native and ornamental plants are on sale to the public. The forest area is under plantation of high value timber species like Mahogany, Teak, Araucaria, Dalbergia, amongst others. 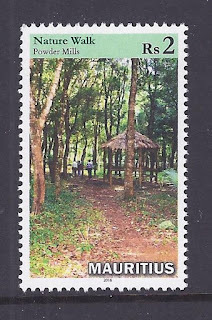 The site is one of the few remaining forested areas in the northern part of Mauritius and is associated with historical events and occupies ancient buildings and monuments including remnants of slave camps. 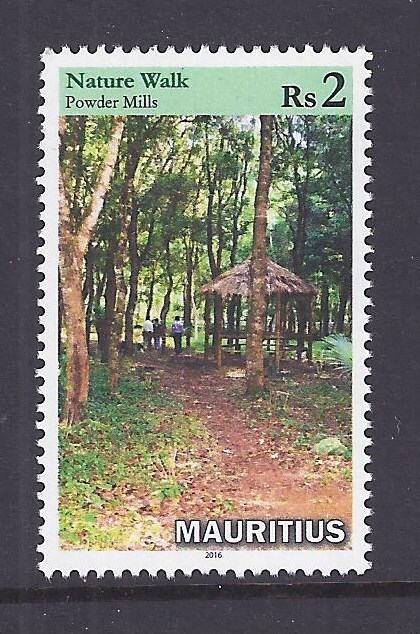 This nature walk is also considered to be an educational visit site for school children. Each year, the nature walk welcomes 25,000 visitors; guided tours are available on request. 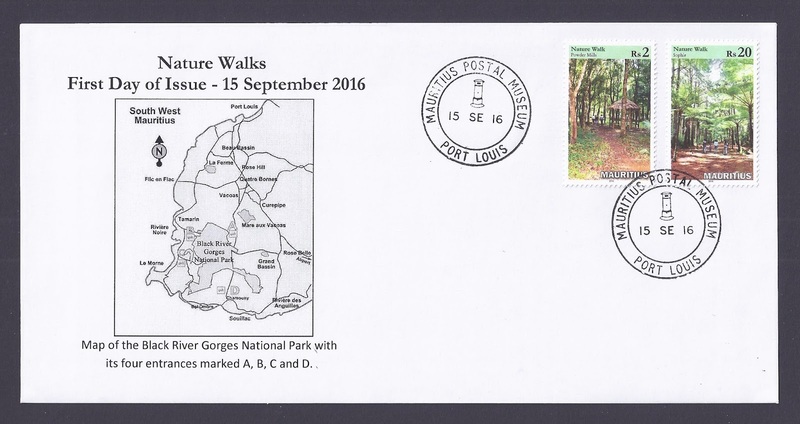 Unofficial FDC showing a map of the Black River Gorges National Park which offers nature walks too. The Sophie Nature Walk is located at Plaine Sophie, near Mare aux Vacoas reservoir. 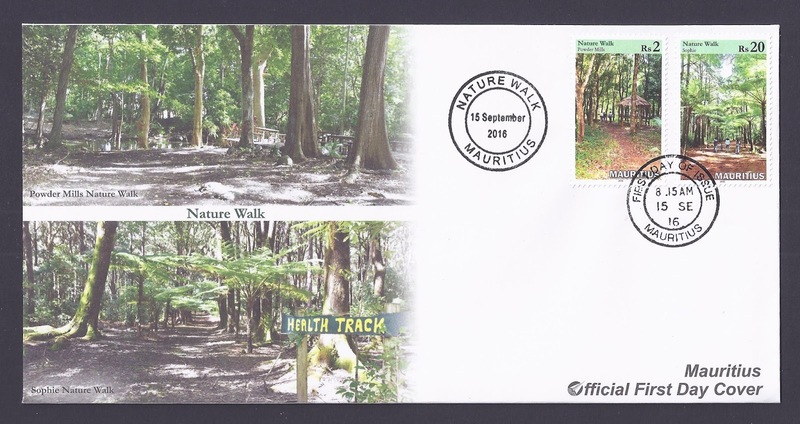 The nature walk covers 10 hectares of State forest land. It also forms part of the catchment area of the Mare aux Vacoas reservoir and consists of mostly of pine plantation managed mainly for ecosystem services, i.e. for soil and water conservation. The region was previously covered with a dense native forest of upland vegetation type. The remnants can still be found at Perrier Nature Reserves in the northern extremity of Plaine Sophie. Inaugurated on August 1, 2013, the nature walk also includes a Visitor's Interpretation Centre, an Arboretum, a Forest Museum exhibiting formerly used forestry manual tools, a Fernery/ Orchidarium, water features, kiosks and picnic areas. A 3 km network of trails and pathways has been created across the forest. The trail goes along Mare aux Vacoas reservoir enabling visitors to enjoy the shade and assess the relevance of a forest as a rain catchment area. Native flora and fauna thrive in the forest. Each year, Sophie Nature Walk welcomes about 8,000 visitors. The third nature walk - Mon Vert Nature Walk - did not make it on any stamp. Unofficial FDC postmarked at Monneron Hill PO and showing Le Dauguet Nature Trail in Port Louis. Le Dauguet was reinstated and embellished in 2015. Printer: BDT International Security Printing Ltd. The Mauritius Postal Services released on 13 June 2001 a set of four stamps to mark the bicentenary of the Baudin Expedition. 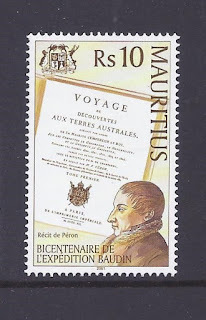 In 1800, Napoleon Bonaparte, then First Consul, commissioned Post-Captain Nicolas Baudin to explore the South-West, West and Northern coastline of New Holland, later to be known as Australia. As the observations were to be conducted in the fields of geography and natural history, the leading ship was named Géographe, its consort vessel under the Commander Emmanuel Hamelin, Naturaliste. A third vessel, the Casuarina was later purchased at Port Jackson. The Institut National had recommended the appointment of a number of scientists, including botanists and zoologists, and some artists, Jacques Gérard Gilbert joining as chief draughtsman. 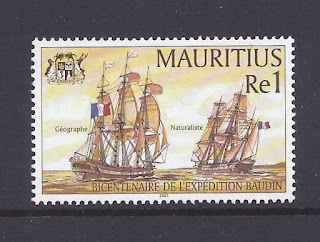 The expedition sailed on October 19, 1800 from the French port of Le Havre and reached Isle de France (Mauritius) on March 16, 1801. When it sailed again on April 25, a number of scientists and artists including Milbert and Garnier declined to continue on the journey on the grounds of illness. Baudin then appointed Charles-Alexandre Lesueur and Nicolas-Martin Petit to replace the defecting artists. Hamelin called again briefly at Isle de France in February 1803 carrying back to France the live animals and part of the collections. Baudin, gravely ill, returned from the uncompleted exploration of the northern coastline of New Holland in August. He brought back an exceptional collection of zoological, botanical and anthropological specimens, enhanced by the excellent illustrations of the artists. On Baudin's death in September, Commander Pierre Bernard Milius was appointed to take the expedition back to France. The time spent on the island by the scientists and artists yielded interesting information on its topography, fauna, especially the marine fauna and flora. 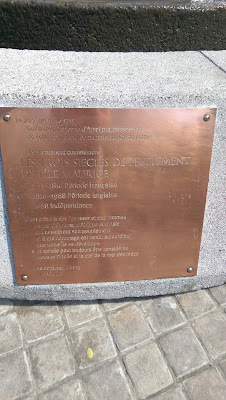 The Géographe left Isle de France on December 16, 1803 and reached Lorient on March 24, 1804. 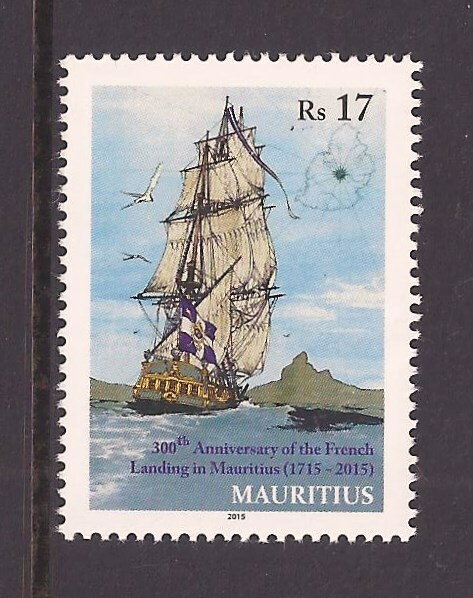 The stamp portrays the two ships on the high seas. The stamp depicts the route taken by the ships on both the inward and outward journeys and the portrait of Baudin. 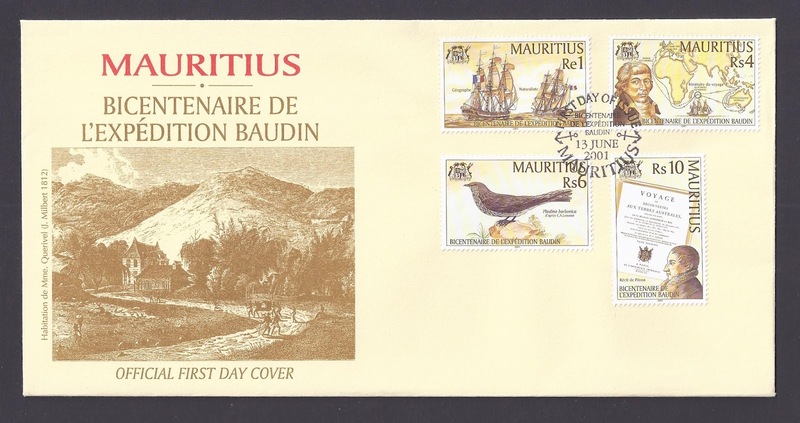 Nicolas Thomas Baudin was born in Ile de Ré, France on February 17, 1754 and died of tuberculosis in Port Louis, Isle de France on September 16, 1803. The stamps features the picture of an indigenous bird of Mauritius, the Phedina borbonica brought back by the expedition. It was painted by Charles-Alexandre Lesueur, born at Le Havre, in 1778 and deceased at Sainte-Adresse on December 12, 1846. He had been promoted draughtsman on the defection of Milbert. François Péron who had joined the expedition as trainee zoologist, was born in Cérilly on August 22, 1775 and died there on December 14, 1810. He had during the journey the opportunity to become the main zoologist of the expedition and to observe natural main in his environment, thereby able to contribute the early writings in anthropology. He was instructed by the government to write the historical part of the Voyage. The first volume of the Historique du Voyage de découvertes aux Terres australes appeared in 1807. The stamp shows the title page and the portrait of Péron. 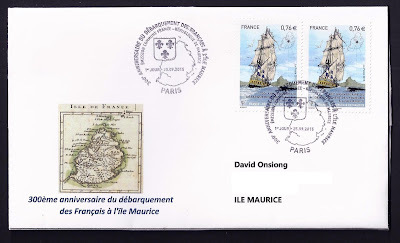 The FDC features an engraving by J. Milbert showing the estate of Madame Querivel where Baudin died. 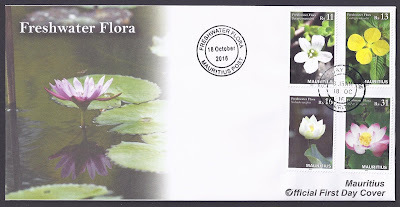 FDC signed by the designer, Anthony 'Tony' Theobald. 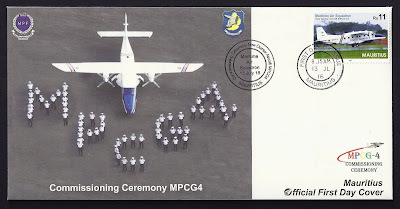 The first flight to Rodrigues operated by Air Mauritius was on 13 September 1972 by a Piper Navajo PA-31 leased from Air Madagascar. This aircraft was the first Air Mauritius owned. 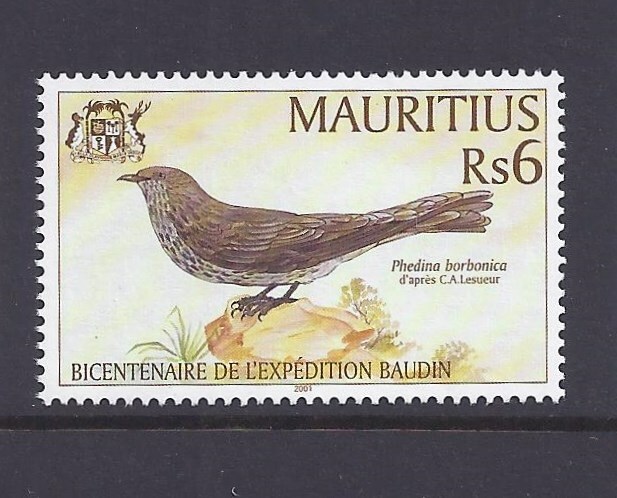 Prior to that, it operated merely as a ground-handling agent for other airlines flying to Mauritius. Today, Air Mauritius operates daily flights to an from Rodrigues using its ATR 72-500s. First Flight Cover handstamped upon arrival in Rodrigues on 13 September 1972 itself. Ganga Talao is a natural lake located in Grand Bassin, Savanne district, in the Central Plateau. It is an important place of worship for Hindus and a centre of pilgrimage especially during the Maha Shivaratree festival. This lake of magnificent beauty with its pure, limpid water was chosen as a suitable site in connection with the Maha Shivaratree festival by a deeply religious priest of Triolet, Pamplemousses district, Pandit Jhummungeer Gossagne Napal, who officiated the first religious service at Ganga Talao. According to existing records, a group of nine persons from Triolet led by Pandit Sajiwanlal Sharma undertook the first pilgrimage to Grand Bassin in 1898. It was a remarkable feat given that it took place under the harsh times of the Indenture system and without any proper access facilities to the Holy lake. The feat however ushered in a tradition which was to gather momentum and become a national event. Every year now, between February and March (the exact date changes every year), pilgrims from all over Mauritius converge to Ganga Talao on foot, wearing white, symbol of purity. Some carry 'kanwars', colourfully decorated altars. Kanwars have highly varied in size and shape over the past few years, some even being fitted with wheels as being too heavy to carry by hand. 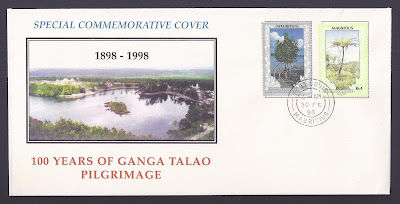 Once at Ganga Talao, pilgrims fulfil prayers and collect some water from the Holy lake. They then return home, still on foot, and pour the collected water onto their respective kovil's (Hindu temple) 'Shivalingam', a sacred stone representing Lord Shiva. Volunteers serve refreshments and food along the way to pilgrims around the clock. To mark the bicentenary of the National Archives, the Mauritius Post released on December 7, 2015 a Rs 10 stamp. The National Archives of Mauritius is a public body operating under of the aegis of the Ministry of Arts and Culture. Although it has its origins from the early settlement in the island dating back to 1721 when the first French settlers came to Mauritius, then Isle de France, its official operation as an institution was proclaimed in 1815 during the British rule of the island. The National Archives, besides being the main repository for housing records of national significance, is the guardian of such records and guarantees their authenticity. Its principal functions are to select, preserve and make accessible public records as reliable sources of evidence for historical, legal, financial, administrative, cultural, genealogical and other purposes. Users of these documents, at both national and international levels, include students, genealogists, individuals, historians, economists, scientists, researchers, journalists, notaries, tourists, organisations, government officials, other professionals and the public in general. The holdings of the National Archives can be traced as far back as the beginning of Dutch settlement in the island in 1598, and now amount to more than 150,000 volumes in both manuscript and printed formats. 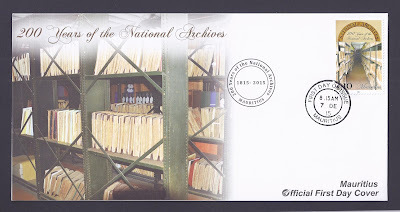 The national collection includes records of French and British administrations of the island, notarial deeds dating back to 1724, copies of maps and plans, stamps, currency notes and coins, minutes of proceedings of municipalities and district councils, lithographs, portraits, photographs, seals and private papers, civil status and census reports and reference library materials. The Reprographic Section provides photocopy services and carries out scanning of records kept in the custody of the National Archives. 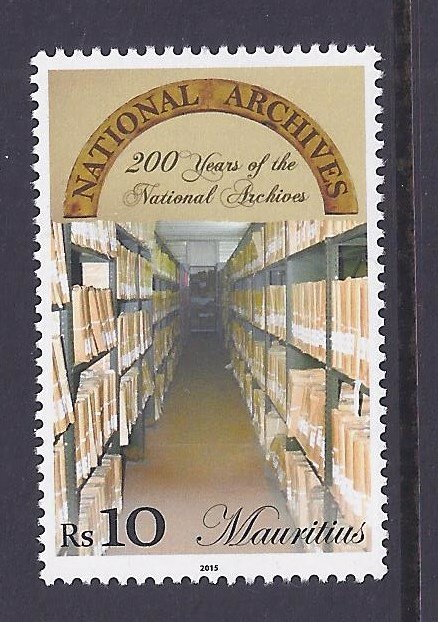 The National Archives Research and Publication Fund finances the publication of research works of archival value produced by the Research Unit of the National Archives and manuscripts of private individuals who have made extensive research in the public archives kept at the National Archives. To date the Fund has financed the printing of seventeen publications. 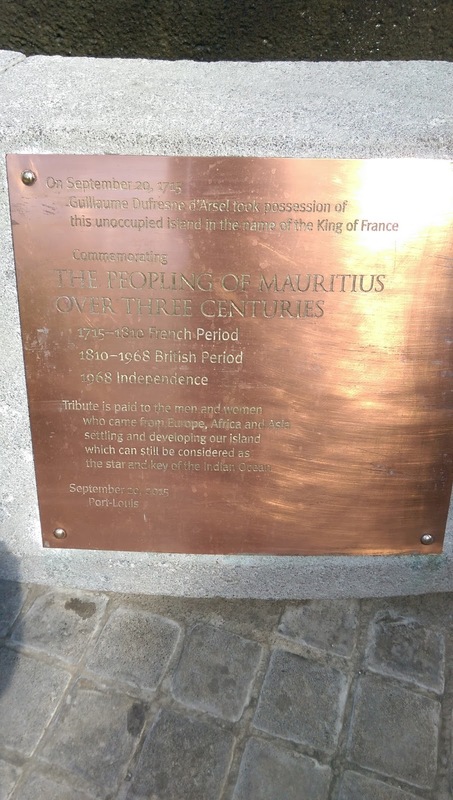 The records of the French occupation of Mauritius were among the first set of records recommended for inclusion in the Memory of World Register in 1997 by UNESCO. These records form part of the key holdings of the National Archives collections. They document the French Colonial Administration on the island. 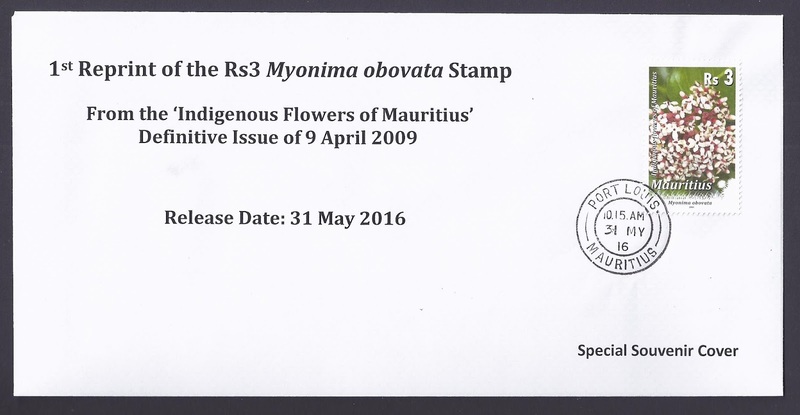 The collections of records pertaining to Indian Immigration and slavery have also been extensively used in the preparation of the dossiers for the successful inscription and recognition of the Aapravasi Ghat and Le Morne sites on the Memory of World Register of UNESCO in 2006 and 2008 respectively. They are now known as World Heritage Sites. To mark the first anniversary of the inscription of the Traditional Mauritian Sega on the UNESCO Representative List of Intangible Cultural Heritage of Humanity, the National Heritage Fund in collaboration with the Mauritius Post issued a Special Commemorative Cover on 27 November 2015. Born within the Creole community, sega tipik is a musical and dance expression that serves as a symbol of Mauritian identity. Mauritian sega is a unique performing art encompassing music, song and dance. The traditional sega arose in the 18th century when African cultures converged in the context of slavery, providing enslaved people of Mauritius a measure of freedom and self-expression. After the abolition of slavery in 1835, sega tipik continued in Mauritian coastal areas where many former slaves moved to. 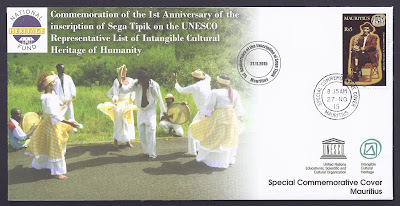 Some main elements characterising sega tipik include the dance, the music, the lyrics, but also the instruments, the context and the language. 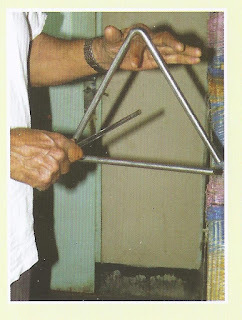 The ensemble of the three traditional instruments: ravann (a frame drum), maravann (a rattle), triyang (the triangle), is the basis of the sega tipik. Lyrics are sometimes improvised by a soloist in Mauritian Creole language. Themes include suffering, daily life or stories. Dance is performed by couples or one woman dancing with several partners in a circle formed by the musicians and the audience. The context of the performance including generally the fire used to heat the ravann is also one of the elements forming integral part of the sega tipik. It was performed in various contexts and consequently there are various forms of traditional sega according to the context and occasion of performance. The sega performance is an occasion to meet, share and socialise, creating a sense of community belonging, a means of social regulation and allowing social cohesion around a shared cultural practice. Today, the "sega tipik morisien" is considered the de facto national dance and music of Mauritius. 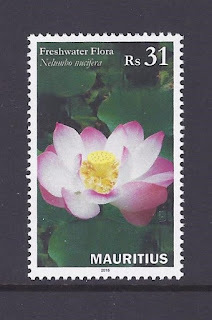 It is a symbol national identity and breaks cultural and class barriers, creating opportunities for intercultural encounters and unifying various groups around a shared Mauritian Heritage. 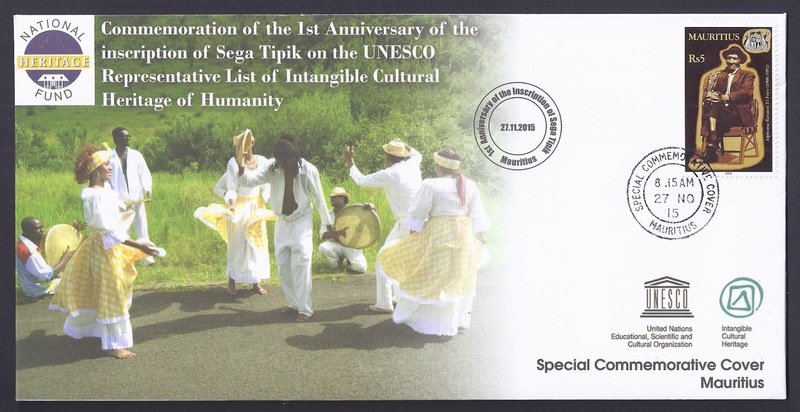 As of 27 November 2014, sega tipik morisien has been inscribed on the UNESCO Representative List of Intangible Cultural Heritage of Humanity. Interestingly, sega is present in different variations all across south east Indian Ocean where slavery was in practice: sega tambour from Rodrigues, maloya from Reunion. 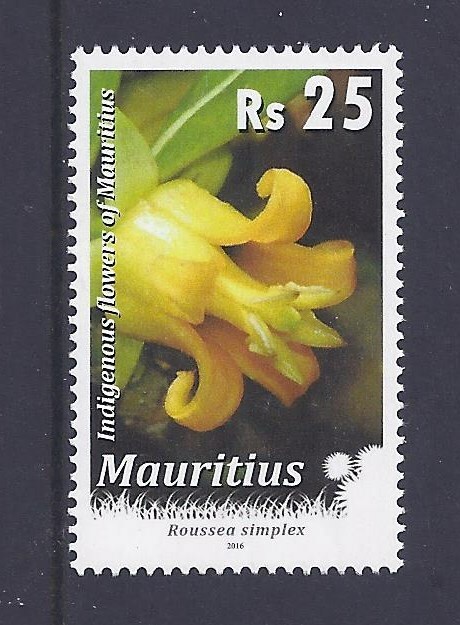 Ti frère who features on the Rs5 stamp on the Special Cover is a very famous Mauritian performer of sega tipik. His most famous songs include Papitou, Anita and Roseda. Other popular artists include late Michel Legris, Fanfan, Serge Lebrasse, Roger and Marie Josée Clency, Nancy Dérougère among others. Text is adapted from the insert. 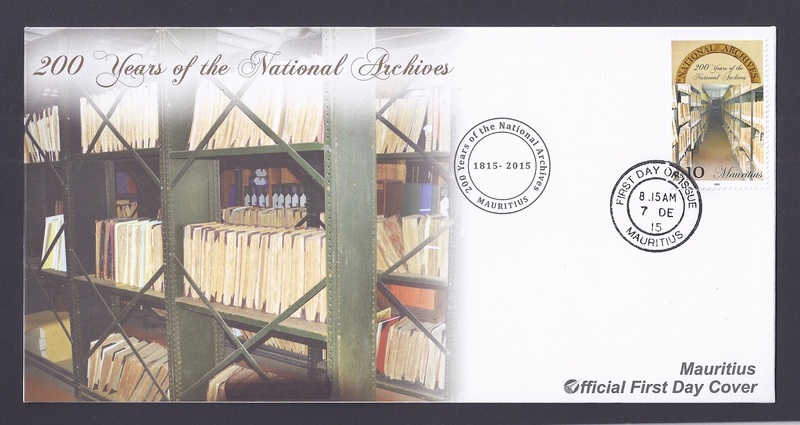 This Special Cover is available for free at the National Heritage Fund Office, 4th Floor, Fon Sing Building, 12 Edith Cavell Street, Port Louis 11302. The Mauritius Post released jointly with La Poste a Rs 17 and a 0,76 € on 25 September 2015 to mark the 300th anniversary of the French landing in Mauritius. 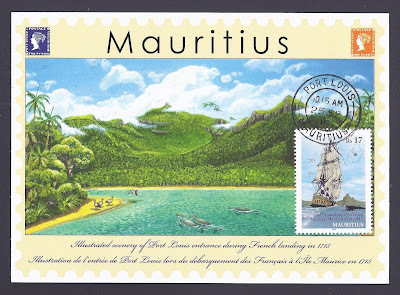 Acting on behalf of the East India Company which was already occupying Bourbon Island - today Réunion - Guillaume Dufresne D'Arsel, a sailor from Saint Malo, landed in Mauritius on board the ship "Le Chasseur" ("The Hunter") on 27 August 1715. The Dutch had previously left the island in 1710 having ruled over it since 1598. After having ensured that the island was not inhabited, he took possession thereof on behalf of the King of France on 20 September 1715 and renamed it Isle de France. The first settlers arrived from Bourbon Island in December 1721 and from France in April 1722. Le Chasseur entering the Baie des Moluques with Tropicbirds flying around it. 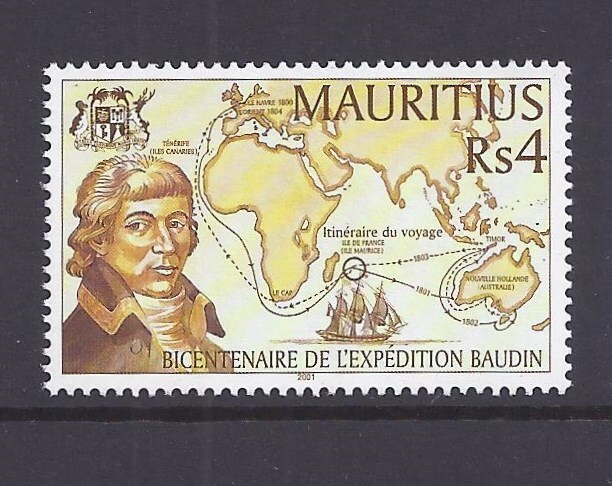 A historic map of Mauritius is watermarked on the top left. The harsh climate and the low population made initial development an arduous task. However from 1735 onwards, the new governor, Bertrand François Mahé de La Bourdonnais, encouraged immigration including skilled labour and undertook a construction programme to set up the colony on solid foundations: roads, aqueducts, brickyards, sugar cane and cassava fields. This programme made life easier for the settlers. The capital Port Louis, became a supply harbour for the French navy, and played a major part in the economic activity of the country, which well-known privateers - such as Surcouf - made famous. 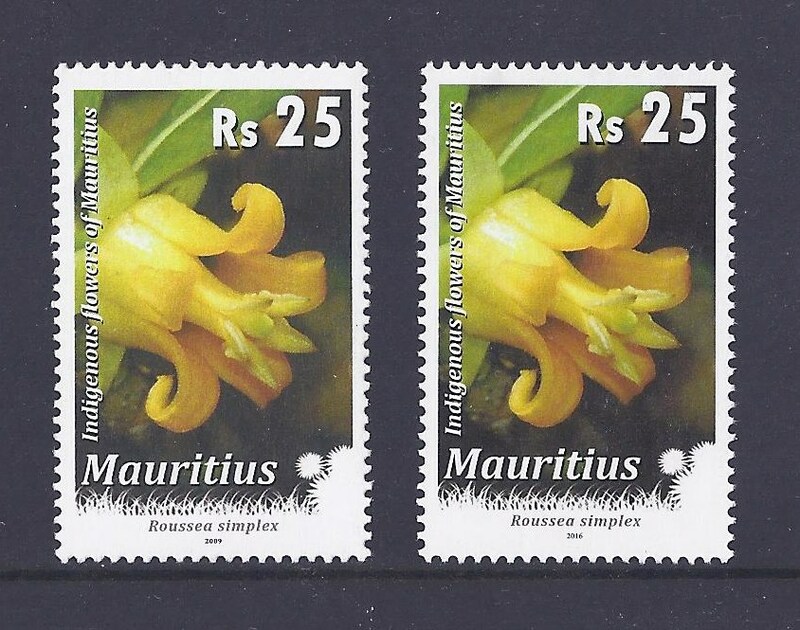 France ruled over Mauritius until 1810 and then gave up its rights to England who colonised the island until its independence in 1968. Today, French presence in Mauritius takes mostly the form of the French language, taught at school and spoken fairly fluently by a good portion of the population, but also Mauritian Creole, a language derived from French and the mother tongue of the majority of Mauritians. Mauritian Creole is the cement that brings together the Mauritian people of diverse origins, yet of converging futures. back when the French landed in Mauritius. Illustration is by Julian Hume. 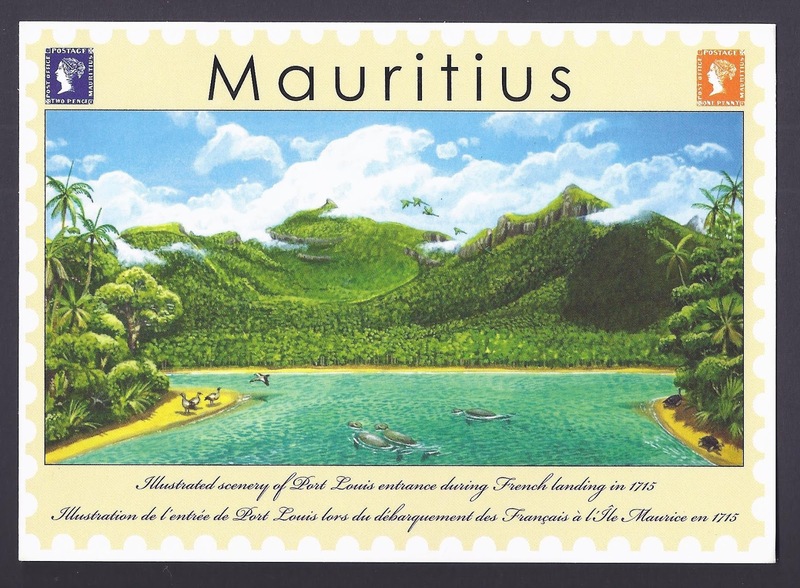 The illustration on the First Day Cover and on the postcard issued by the Mauritius Post depicts the most probable environment which Guillaume Dufresne D'Arsel met with when he landed with his crew through the "Baie des Moluques". The coastal waterways in which Dugongs (Dugong dugon) were once extremely common, were intersected with small forest-covered islets. The Dodo (Raphus cucullatus) , Mauritian sheldgoose (Alophen mauritiana), Echo Parakeet (Psittacula eques echo), Mauritian Giant Tortoises (Cylindraspis sp. ), and a range of other endemic Mauritian animals all occurred in forests and on the coast where present-day Port Louis now stands. 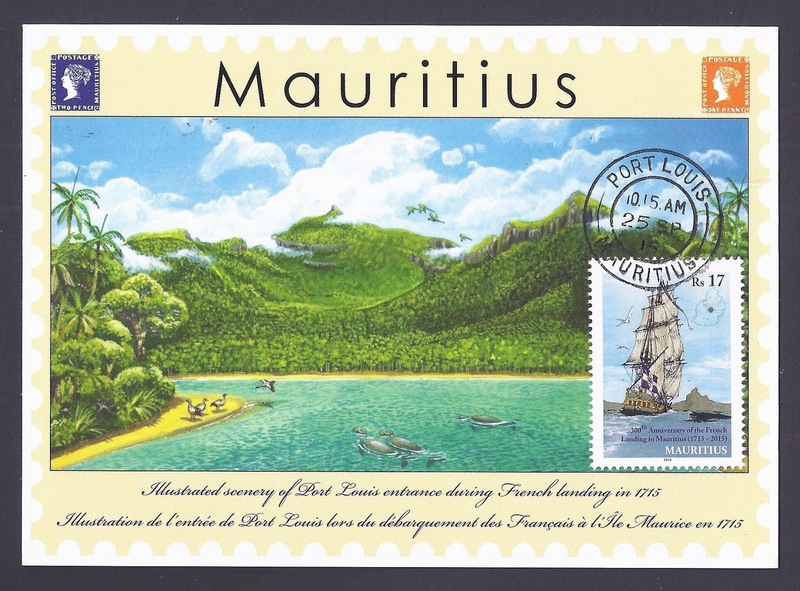 By the time of the French landing in 1715, the forests surrounding Port Louis were still comparatively intact, but the Dodo was extinct, and the goose, dugong and tortoises almost so. 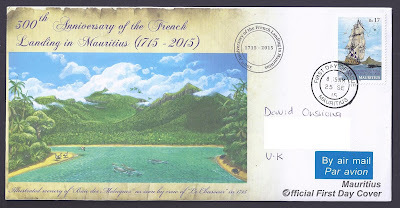 Unofficial FDC from France to Mauritius (La Poste do not issue official FDCs). Mandaté par la Compagnie Française des Indes Orientales, qui colonisait déjà l'Ile Bourbon - aujourd'hui La Réunion - Guillaume Dufresne D'Arsel, un marin français originaire de Saint Malo, débarqua à l'Ile Maurice à bord du navire "Le Chasseur" le 27 août 1715. Les Hollandais avaient préalablement déserté l'île en 1710 après y avoir régné depuis 1598. Après s'être assuré que l'île était déserte, il en prit possession le 20 septembre 1715 au nom du Roi de France at la renomma Isle de France. Les premiers colons arrivèrent en décembre 1721 de l'Ile Bourbon et en avril 1722 de la France. Le climat et la très faible population rendirent l'implantation initiale très difficile mais, à partir de 1735, le nouveau gouverneur, Bertrand François Mahé de La Bourdonnais, encouragea l'immigration y compris celle de la main d'oeuvre qualifiée et entreprit un programme de construction qui établit enfin la colonie sur des bases solides: routes, aqueducs, moulins, briqueteries, champs de canne à sucre et de manioc. Ces développements favorisèrent l'arrivée des colons. 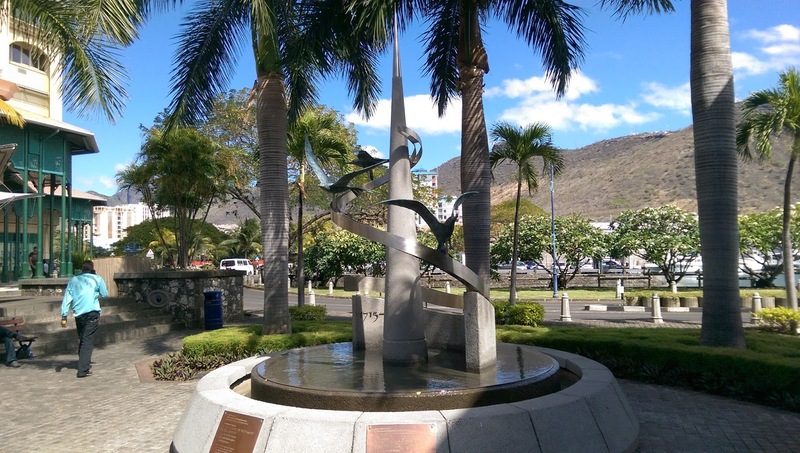 Port Louis, la capitale, devint un port de ravitaillement de la marine française et fournit à la communauté l'essentiel de son activité que des grands noms, comme celui du corsaire Surcouf, rendront célèbre. La France occupa l'île jusqu'en 1810, année à laquelle elle cèdera ses droits à l'Angleterre qui l'administrera jusqu'à son indépendance en 1968. Aujourd'hui la présence française à l'Ile Maurice se fait toujours sentir à travers la langue française, enseignée à l'école et parlée assez couramment par une bonne partie de la population, mais aussi à travers le créole mauricien, langue dérivée du français et langue maternelle de la majorité des Mauriciens. Le créole mauricien est le ciment qui unit la population mauricienne, d'origines diverses mais d'avenirs convergents. Paysage illustré de l'entrée de Port Louis pendant la période 1715. L'illustration sur le pli premier jour montre le milieu le plus probable que Guillaume Dufresne D'Arsel a croisé quand il mit pied à terre avec son équipage dans la Baie des Moluques. Les cours d'eau dans lesquels les dugongs (Dugong dugon) étaient autrefois très communs, croisaient des îlots couverts de forêts. 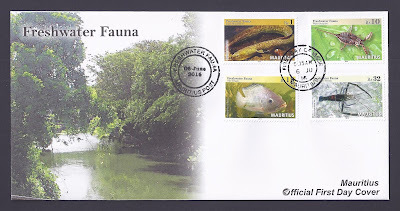 Le Dodo (Raphus cucullatus), l'Oie de l'Ile Maurice (Alopochen mauritiana), la Grosse Cateau Verte (Psittacula eques echo), des Tortues Géantes de l'Ile Maurice (Cylindraspis sp.) 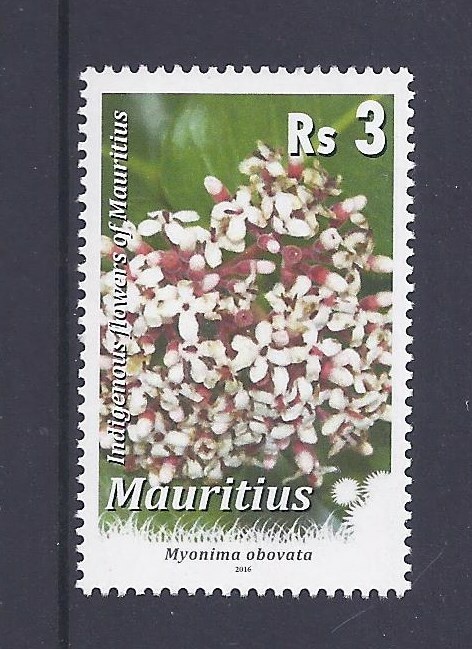 and une variété d'autres espèces endémiques de l'Ile Maurice vivaient dans les forêts et sur la côte où Port Louis se trouve actuellement. Lorsque les Français débarquèrent en 1715, les forêts entourant Port Louis étaient relativement vierges, mais le Dodo avait déjà disparu, et l'oie, le dugong et les tortues pratiquement. Special Souvenir Cover released by the Mauritius Post featuring both stamps. Illustration/ Illustration: Rs17 - Le Chasseur entering the Baie des Moluques with Tropicbirds flying around it. A historic map of Mauritius is watermarked on the top right./ Le Chasseur entrant dans la Baie aux Moluques avec des phaétons, ou paille-en-queue, volant autour. Une carte historique de l'Ile Maurice est en filigrane en haut à droite. 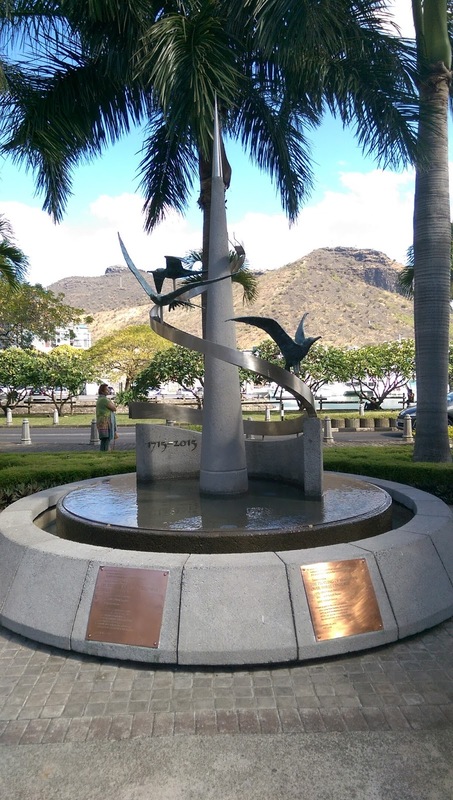 Le monument se trouve en face du Blue Penny Museum, au Caudan Waterfront à Port Louis. Jean-Claude Montocchio. 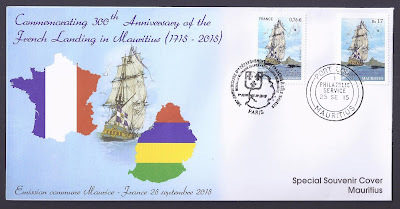 300e anniversaire de l'arrivée des Français à Maurice (lemauricien.com, 27 September 2015, published in Week-End) http://www.lemauricien.com/article/300e-anniversaire-larrivee-des-francais-maurice - this article focuses on the stamps themselves, very interesting points made from a philatelic and a historic perspectives. On 15 August 2016, octopus fishing was officially closed in Mauritius till 15 October 2016. In 2015, octopus fishing was closed from 10 August till 10 October from Le Morne to Souillac in the south of Mauritius on a pilot project to trial this programme which is already in place in Rodrigues since 2012. 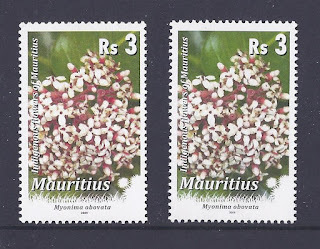 The 2016 closure is the first one at national level in Mauritius, including Agaléga. The main reason behind this measure is the drastic decline in volume of octopus fished every year, from 200 tons in 1990 to 30 tons currently. Octopus is considered a delicacy in Mauritius; it is commonly referred to as ourite, the French names being either pieuvre or poulpe. During the current closure, frozen octopus from Madagascar and Rodrigues will still be available on the market. The objective of this fishing closure and its timing is to allow female octopuses to lay their eggs and to allow existing specimens to grow up in size. Bigger octopuses are hence expected in October. Rodrigues is planning a second closure per year in February 2017 when young octopuses come back to populate lagoons. The 2015 closure in the south was on a voluntary basis while the 2016 one is an official closure with legal bearing. The National Coast Guard and the Environment Police will be on the lookout to enforce the closure. Contraveners will be subject to a fine not exceeding Rs 50,000. 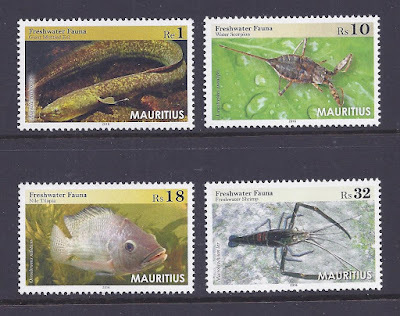 The Ministry of Fisheries set up this programme with the support of the Indian Ocean Commission (Commission de l'Océan Indien, COI), the GEF Small Grants Programme of the United Nations Development Programme (UNDP), and of several NGOs: Eco Sud and its Lagon Bleu project, Eco Mode, Reef Conservation, and the Mauritius Marine Conservation Society (MMCS). 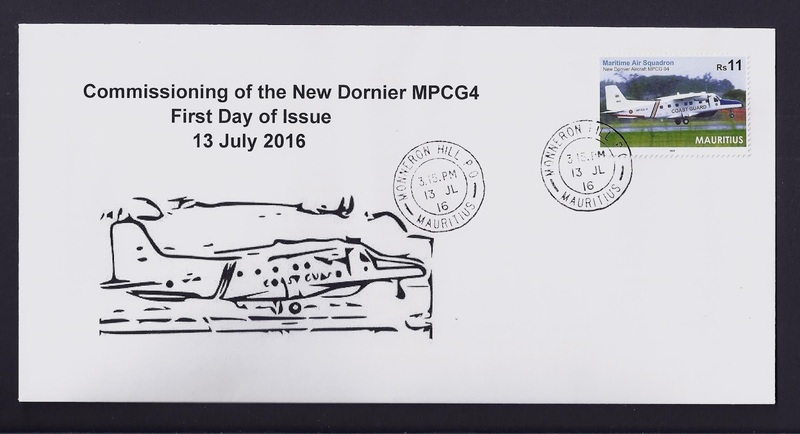 This Special Commemorative Cover was postmarked on 16 August 2016, 15 July being a public holiday for the Assumption of Virgin Mary, at Pointe aux Sables Post Office. Pointe aux Sables is a small fishing village on the southwestern outskirts of Port Louis. The stamp used is the Rs 14 Green Turtle (Chelonia mydas) stamp from the omnibus issue with the islands of the Indian Ocean and France of 9 October 2014. 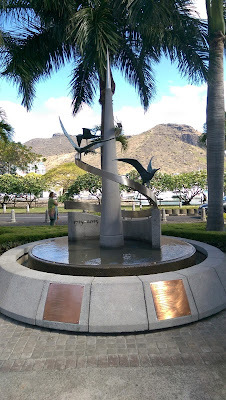 The Green Turtle symbolises the fragile resources that surround Mauritius and its dependencies. It used to be hunted too like the octopus, until its population reached such a critical number that its hunting was prohibited. N.B. : This is a private issue, not linked in any way to the Mauritius Post, the Ministry of Fisheries, the COI, the UNDP, Eco Sud, Eco Mode, Reef Conservation or the MMCS. The Mauritius Post issued a Rs11 stamp on 13 July 2016 to mark the commissioning ceremony of the new Dornier aircraft of the Maritime Air Squadron of the Mauritius Police Force. The commissioning ceremony was held at the Sir Seewoosagur Ramgoolam International Airport, Plaisance, and was attended by the Prime Minister, Sir Aneerood Jugnauth, the Commissioner of Police, Mario Nobin, the Chairperson of the Mauritius Post, Gayetree Usha Brijmohun and the Chief Executive Officer of the Mauritius Post, Giandev Moteea amongst others. 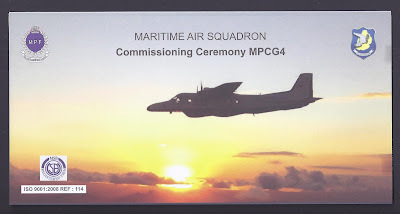 The Maritime Air Squadron (MAS) was commissioned on 17 July 1990 by Sir Veerasamy Ringadoo, the then Governor of Mauritius. The new Dornier MPCG4 will be the fourth fixed-wing aircraft to join the squadron; the squadron currently runs two other Dorniers and one Defender. 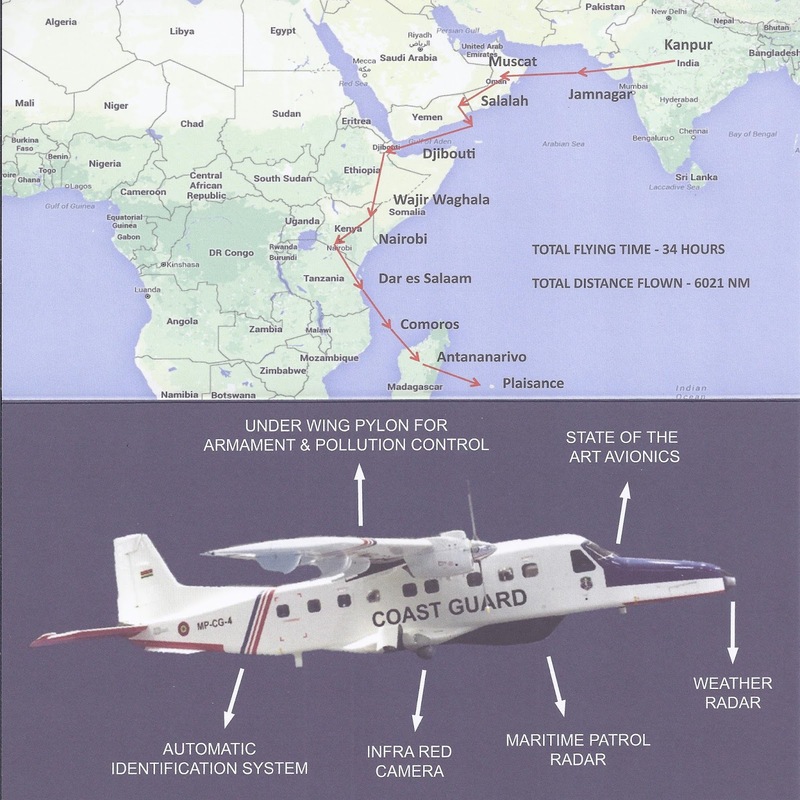 The aircraft is state-of-the-art fitted with the latest Maritime Patrol Radar, Forward-Looking Infrared Camera (FLIR), Global Positioning System (GPS), Automatic Identification System (AIS) and communication system. The aircraft offers an outstanding field of view and a comfortable environment which substantially reduces the crew fatigue and workload, thus ensuring that a high-level of vigilance is maintained throughout Economic Exclusive Zone (EEZ) and Search and Rescue (SAR) missions. 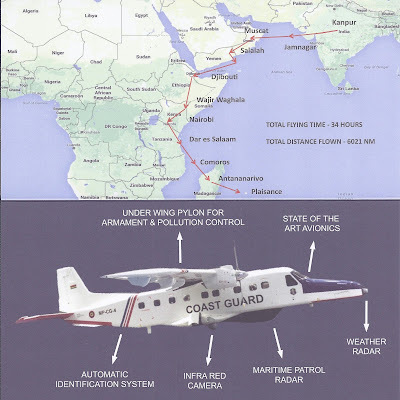 The crew that extensively test-flew the aircraft at HAL, Kanpur, India, then ferried it to Mauritius through several countries along the western coast of the Indian Ocean, accumulating a total flying time of 34 hours and a total distance of 6,021 nm (11,150 km). 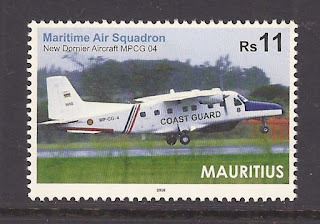 Besides their Exclusive Economic Zones (EEZ) and Search and Rescue (SAR) missions, Dornier aircrafts allow an additional communication means via an air link with the Agaléga Post Office, the only provider of postal, financial and banking services to the inhabitants of these outer islands of Mauritius despite remoteness from the mainland. 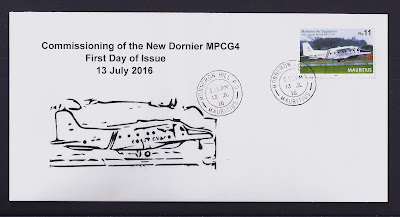 August 2002 for example marked the opening of the Agaléga Post Office and the first dispatch of mail to the islands by air by a Dornier aircraft. Anguilla marmorata has a robust body with a compressed rear part. It has a yellowish to olive or brown, mottled with dark greenish brown back with a lighter colouration belly. This species can reach up to 2 m in length and is normally active at night, and feeds on prey such as crabs, frogs and fish. Eel is a highly commercial food fish and various life stages, ranging from juvenile to adult, are harvested and traded on a global scale for consumption, with current demand predominantly driven by East Asian markets, in particular Japan and mainland China. The giant mottled eel is native to the Indo-Pacific region. 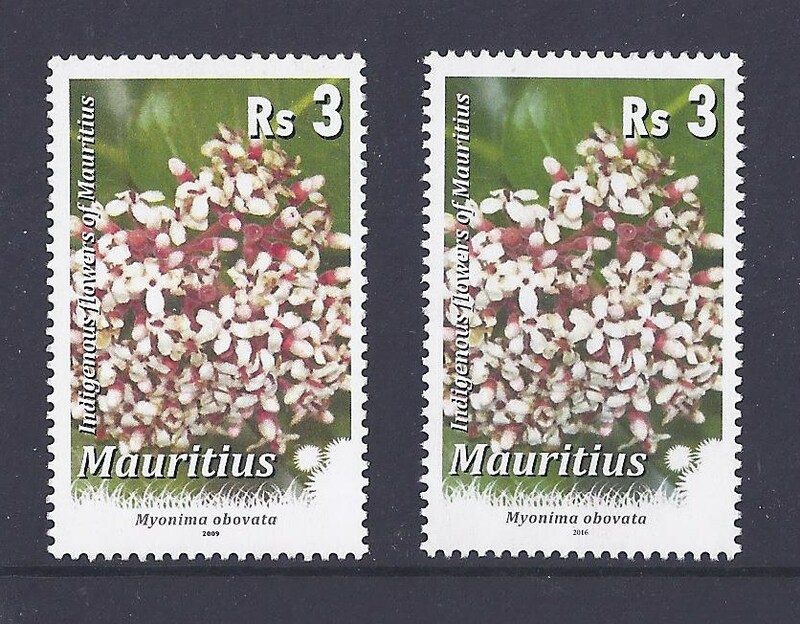 This species is native to Mauritius and can also be found in Madagascar, Réunion and the Seychelles. It commonly dwells in rivers and lakes, including artificial ones, and reservoirs, and is found under crevices or hides under rocks. Adult eels normally migrate to deep water in the sea where they breed and die. If they fail to find a way to the sea, eels can grow very big within the lake reservoir. According to the International Union for Conservation of Nature (IUCN), it is considered Least Concern at present as there is no evidence for population decline. 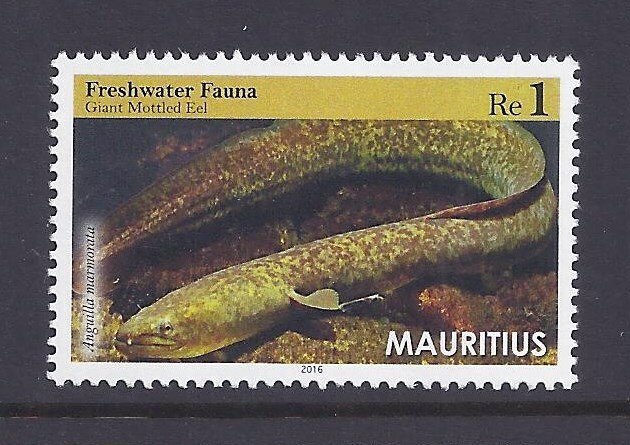 In Mauritius however, eels are now declining in number due to over-exploitation, reclamation of wetlands and marshy areas as well as pollution. A species commonly found in streams, ponds, basins, etc, where it has been observed to prey on mosquito larvae and other aquatic animals. 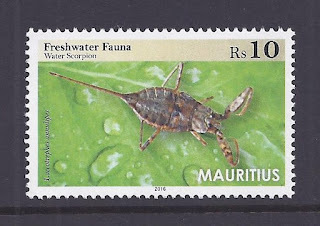 They are commonly called water scorpions due to their resemblance to scorpions. They live in shallow, muddy water. They swim slowly, often crawling on objects in the water. They come to the surface for air and often hide under stones near water. They can reach about 6 cm in length but about half is the siphon. Regarding vulnerability status - not known. 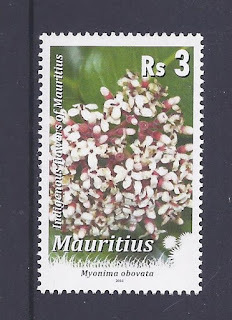 It has been recorded all over the island of Mauritius in the past, but it seems to be difficult to find now. The Nile tilapia is native to Africa and the Middle East. It has a distinctive regular, vertical stripes extending as far down the body as the bottom edge of the caudal fin, with variable coloration. Adults reach up to 50-60 cm in length and up to 4 kg. It lives for up to nine years. The Nile tilapia tolerates brackish water and prefers warm temperature. It is an omnivore, feeding on plankton as well as on higher plants. This fish is currently one of the most important species in the aquaculture industry across the world. It is mainly due to its good flesh quality, disease resistance and high growth performance, acceptance to a wide range of feed and adaptability to the different methods of culture. This species also feeds on mosquito larvae and is thus beneficial in the control of mosquito population. 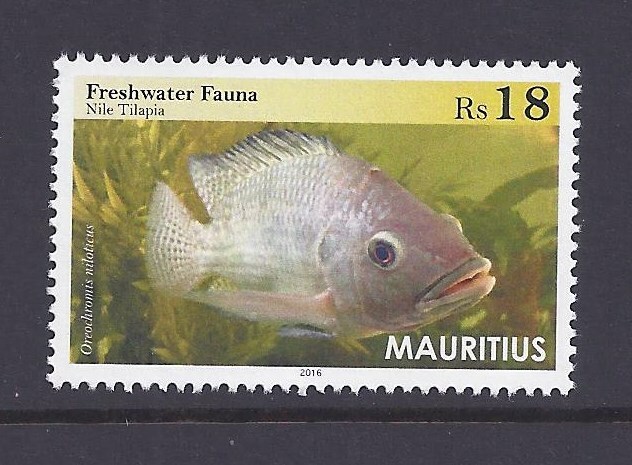 In Mauritius, Oreochromis spp. 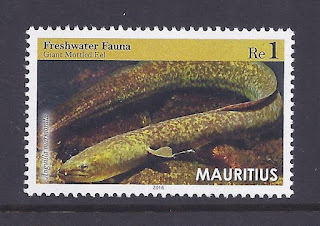 was first introduced in the 1950s and was commonly found in water bodies such as rivers and reservoirs, mainly in Mare aux Vacoas and Mare Longue. 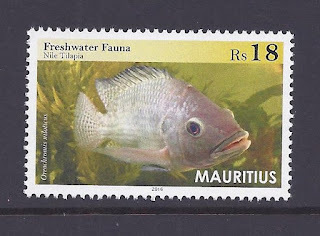 Besides the Oreochromis niloticus normal colour, a Red Tilapia hybrid locally known as "berri rouge" also exists in Mauritius, which is a hybrid of three species of Oreochromis spp., introduced from Malaysia in 1990. Seed production is being undertaken at the Albion Fisheries Research Centre (AFRC) under the aegis of the Ministry of Ocean Economic, Marine Resources, Fisheries, Shipping and Outer Islands to produce quality fingerlings to service fish farmers. Fry are collected from broodstock ponds and cultured in tanks until they become fingerlings. Presently, the main investor in the culture of Oreochromis spp. is the private sector supported by the AFRC for hatcheries facilities. Commonly known as camaron, Macrobrachium lar can reach 8-10 cm in length. This large prawn has dark red-violet scales and long pincers and the female is smaller than the male. The eggs are carried by the female to brackish waters of estuaries where the juveniles will hatch and grow. The young ones then migrate back upstream. This prawn is found in well-oxygenated rivers throughout the Indo-Pacific region, usually hiding underneath stones. 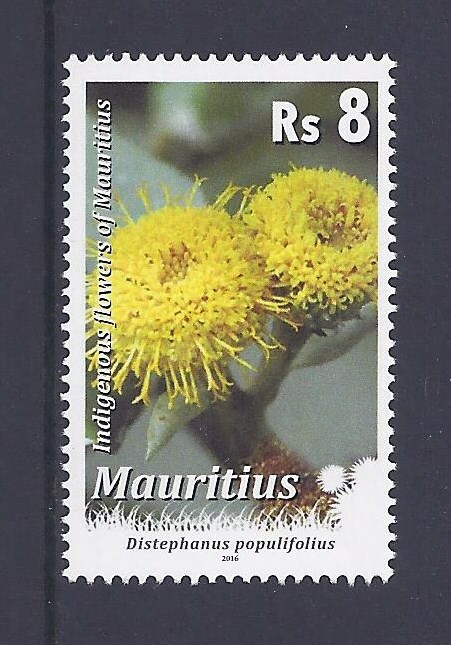 It is native to Mauritius. According to the IUCN it is least concern. 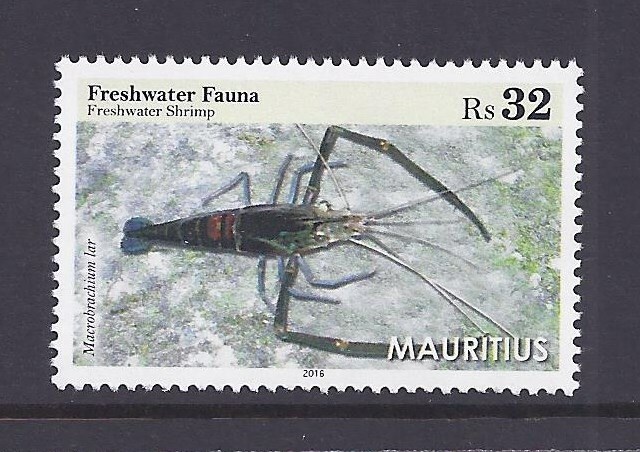 In Mauritius, freshwater shrimp is now rare due to overfishing and pollution. 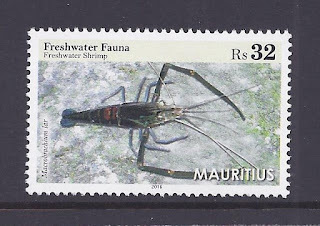 Macrobrachium lar is considered a delicacy in Mauritius. It has never been intensively farmed but juveniles migrating upstream are captured and used to stock ponds. In the 19th century, when the native orchid plant Cryptopus elatus was common along river banks, its roots were used to make a noose to capture river prawns, hence the name "liane camaron" given to that species of orchid. 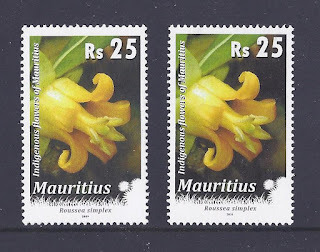 On 24 and 31 May 2016, the Mauritius Post released new reprints of the Rs 8 and Rs 25 denominations and of the Rs 3 denomination respectively of the 9 April 2009 Indigenous Flowers of Mauritius definitive issue. 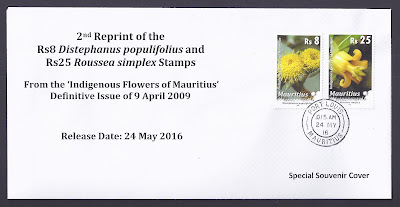 It is the second recorded reprint of the Rs 8 (Distephanus populifolius) and Rs 25 (Roussea simplex) stamps after the 1 June 2010 reprints (a reprint of the Rs 15 Aphloia theiformis stamp was also issued on that date). 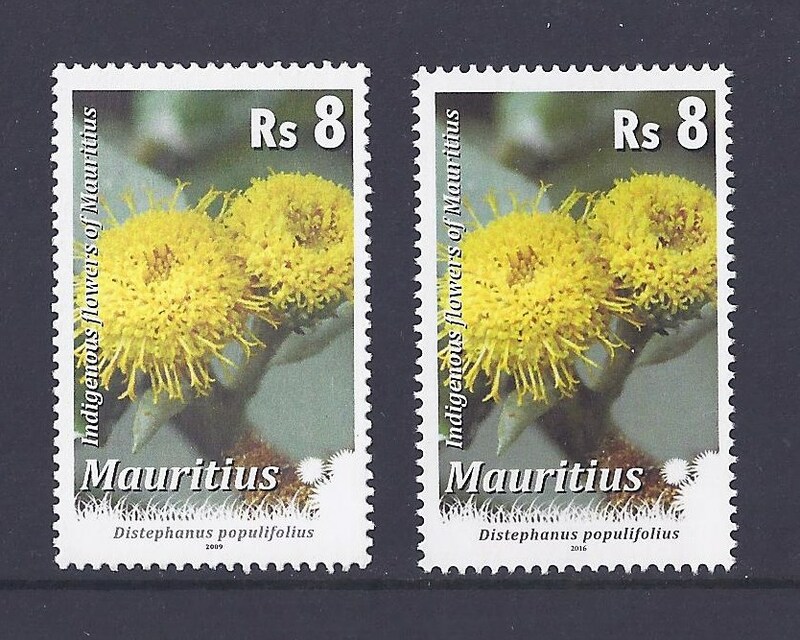 According to the inserts of the 2009 FDCs, Distephanus populifolius is a rare endemic plant found only on dry exposed mountain tops where it grows on rocky medium. It bears composite white and yellow flowers and its silvery leaves offer a perfect camouflage with its rocky surroundings. Roussea simplex on the other hand is a rare endemic shrub now found in few places like Le Pouce, Grand Bassin, Bassin Blanc, Trou aux Cerfs and Combo. Its orange yellow bell-shaped flowers are conspicuous and attractive. It is however the first recorded reprint of the Rs 3 (Myonima obovata) stamp. Myonima obovata is a small shrub of mid altitude dry forests, which bears nice clusters of small pinkish white flowers. The beauty of this plant lies in its juvenile leaves where a mosaic of red, purple and green venation under a thin waxy layer catches one's attention.